Start at the intersection of RT 202 and 20, just outside Granby CT.
Head West on RT 20. Take 20 into to Winsted, where you need to switch to RT 44 still heading west. Take this up through Canaan, CT. There's a bunch of restaurants in town, if you are getting hungry. Stay on 44 to Lakeville, get on 41 South, and in Sharon Switch to 4 South, which takes you into Cornwall Bridge. This brings you through some towns where there are tons of places to eat, shop, or stay. From Cornwall Bridge, take 7 South along the Appalachian Trail again, to New Milford. At New Milford, turn onto 45 North, back up to Cornwall Bridge. From there, get on Route 7 North to Canaan CT, where the trip ends. This ride brings you along the North West border of CT, across top of the Appalachian trail, and then along it, as you travel South. The route is a long loop, and you could turn it into a nice weekend trip, especially if you have to travel a bit to get out there. Most of this route is along designated scenic Routes. Some roads are really twisty, and steep. Along a few sections, the roads aren't in the best shape, but the scenery makes up for it. A solid 5 as there are several museums, state parks, towns and places to stay on this route. Inns and B&Bs abound along Route 7, especially. Route 7 is really famous for its antique shops too. Note: If you look to make a weekend out of this trip, be advised that RT 7 is a popular destination, and you should book rooms in advance; especially in the Fall. Lakeville, Salisbury, and Cornwall all have tons of B&B's to stay at: Look on tripadvisor.com for ratings, etc . on October 23, 2017 1 out of 1 members found this review useful. What an incredible ride. We came from RI so had to take rt 6 west out to the start of this ride, about 70 miles to get to the start. Gorgeous lookouts, beautiful scenery, and great restaurants along the way. Stopped in Canaan at Roma Pizzaria, you can't miss it. It is BYOB, and there is a liquor store off to the right about a minute away where they sell single beers to go with your pizza. Roma is highly recommended, especially their garlic knots. After filling our bellies we carried on through rolling farmlands. 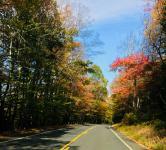 We will definitely travel to do this road again, if you are from Connecticut you need to experience this trip. 5 stars all the way with tons of small shops,antique stores, and quaint restaurants along the way. on March 31, 2017 1 out of 1 members found this review useful. Great run. Took me 8 hrs from Bridgeport back to Bridgeport. Real nice ride.Although I did not stop in any of the towns I passed through (I was alone) they were all nice.Bikes everywhere.will make sure I do some sight seeing next time through.Well worth the trip. on October 9, 2010 1 out of 5 members found this review useful. Taking this road tomorrow, in reverse from southern CT, will post pics and comments tomorrow.